The logistics industry being largely impacted by the performance of various sectors, is yet reeling from a phase of low growth due to the economic situation. 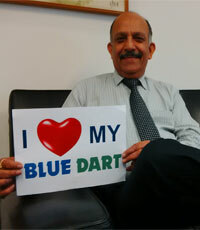 How has been the going for Blue Dart in India? What have been your major highlights? Blue Dart was formed in Nov 1983 by three young entrepreneurs, Clyde Cooper, Tushar Jani and Kushroo Dubash with a capital of Rs 30,000 and 200 sq ft. It commenced its operations with its first few consignments which were urgent letters and a few shipments, which the company sorted under the staircase of a building. Blue Dart, in its early years, forged ties with Gelco Express International, UK to introduce an international air package express service from India. In 1993, anticipating the tremendous potential in India, Blue Dart shifted focus from international to domestic services. In 1994, the company went public with an equity offer of 2.55 million shares, at a premium of 14 times, worth Rs 382.5 million. In the same year, Blue Dart Aviation was incorporated. Blue Dart Aviation began operations in June 1996, primarily to support the growing demands of Blue Dart’s express business, but has ventured further and optimised its opportunities, carving for itself a significant niche. Today, it remains the most successful express operator in the Indian skies, with scheduled night operations focused on early morning, time-definite deliveries. In 2002 Blue Dart entered into a path-breaking sales alliance with DHL Express. In 2005 DHL Express (Singapore) Pte. Ltd. acquired 81.03% of the equity share capital of the Company, but later reduced its stake to 75% in order to comply with statutory requirements. In 2007, Blue Dart forayed into Ground Express and launched several features like Freight on Delivery (FOD), Freight on Value (FOV) and Demand Draft on Delivery (DOD). Since 2010-11, Blue Dart has retained a strong focus on the e-tailing segment and introduced the Cash on Delivery (COD) service as an additional payment option to customers. Today e-tailing is the highest revenue contributors for Blue Dart. In 2011, in terms of technological and GOGREEN advancements, Blue Dart launched Smart Truck an “intelligent” pick-up and delivery vehicle that combines a number of innovative technologies including a route planner. In 2014, Blue Dart successfully became a part of Deutsche Post DHL (DPDHL) Group’s Post – eCommerce – Parcel (PeP) division which has further enabled the company to tap on the strong growth momentum seen in the dynamic e-tailing market in India. In 2015, Blue Dart introduced Parcel Locker, a 24×7 automated service that will allow recipients of parcels to collect their shipments from the facility. This mechanism will benefit e-tail customers who may not be present during regular delivery hours, and can collect their shipments from the PARCEL LOCKER at any time as per their convenience. The service will also be beneficial for those who travel often, especially with the festive season around the corner. While e-tailing offers customers the opportunity to shop around the clock, with PARCEL LOCKER, Blue Dart will offer the convenience of a 24 hours a day/7 days a week/365 days a year delivery mechanism. Blue Dart throughout its 32 years of existence has grown from delivering a few dozen packages outside Mumbai airport on its first night of operations, to being one of the strongest company’s handling lakhs of shipments each day. Today Blue Dart, South Asia’s premier express air and integrated transportation & distribution company, accesses the largest and most comprehensive express and logistics network worldwide, covering over 34,720 locations and more than 220 countries. It offers an entire spectrum of distribution services including air express, freight forwarding, supply chain solutions and customs clearance. The Blue Dart team drives market leadership through its dedicated air and ground capacity with 5 aircrafts, 8,348 vehicles and 79 express hubs, cutting-edge technology, wide range of innovative, vertical specific products and value-added services to deliver unmatched standards of service quality to its customers. Blue Dart has a strong people force of 10,139 motivated and committed Blue Darters. In the Employee Satisfaction Survey (ESS) 2015, Blue Dart’s overall Mean Satisfaction score at 4.71 and Active Leadership at 4.76% were ranked at an all-time high. Over the years, though the economy faces several challenges, Blue Dart has continued to be resilient and has displayed exemplary quality and service excellence by incorporating high benchmarks and quality standards in every aspect of business. Blue Dart has steered through successfully with a clear focus on fundamentals like Quality, Consistency, Reliability, Passion and Commitment. Blue Dart is the undisputed market leader with 53% share in organised air and 15.4% in organised ground express in India. The company has consistently displayed strong performance thereby ensuring 21x appreciations in Shareholders Wealth in 10 years. What are your key focus areas and what are the challenges you face? 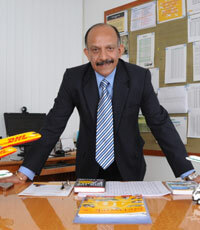 Since I took over as the Managing Director, the company has broadened its strategic focus from being an air express company since inception to being a company that straddles customer offerings across time definite, priority, deferred as well as focus on industry specific solutions in air and ground express segments. With inflation rising, there is no denying that cost pressures have been increasing. Though the express industry is highly dependent on the economy, our financial results have been good. Blue Dart performed reasonably well on all fronts and capitalized on its strong brand equity and focused growth plans, customer centricity, service quality, strong workings with group companies. Given the slowdown, any impact to the top line business affects the bottom line as we have a high fixed cost model. Our industry, especially the air express segment, is the bell weather for the economic activity in the country. The logistics industry being largely impacted by the performance of various s sectors, is yet reeling from a phase of low growth due to the economic situation. The strong headwinds faced by the Indian economy such as slowing GDP, spiralling WPI and CPI indexes, falling investor confidence in domestic and FII, consistently high inflation rate coupled with high interest rates for commercial borrowings, widening trade deficit, cost fluctuations and minimum wages, dollar appreciation and the rupee depreciation leading to high operational costs have greatly impacted the sector. One of the greatest challenges the industry faces is lack of good infrastructure which is essential for speedy and reliable services that are the key elements of an express industry and the industry concerns need to be addressed in the best interest of the sector so as to effectively partner India’s growth. Infrastructure plays an important role in development. Road infrastructure is the largest bottleneck even though over 70% of freight transportation in India is via roads. The air infrastructure in the country is inadequate in terms of cities covered and cargo handling capacities leading to significantly higher dwell time as compared to international standards. Insufficient aircraft parking bays, truck docking stations, limited space for express terminals, clearance processes leading to delays and impact operational cost. Besides this the other challenges include lack of warehouses, facilities to handle odd-size and heavy cargo such as forklifts, perishables (vegetables, fresh flowers, fruits, etc), dangerous goods, live animals and valuables. Post the privatization of major airports, the operating cost at those airports have also multiplied manifold without any significant improvement or differentiation in services offered. Land lease rentals at major airports at key metros in India have risen considerably. The Aviation Turbine Fuel (ATF) price with its high price volatility and multiple rates across states due to different tax rates directly impacts operating margins. How has the logistics space evolved over the years? Do you think that with the number of unorganized players and the success of E-Commerce, this industry is likely to see a wave of consolidation sometime soon? Logistics is the backbone of the Indian economy, providing efficient, cost effective flow of goods on which other sectors depend. The sector is evolving rapidly and it is the interplay of infrastructure, technology and new types of service providers that will define whether the industry is able to help its customers reduce their logistics costs and provide effective services. With the Indian e-tailing industry expected to grow at 52% from 2014 to 2020, the sector has been witnessing phenomenal demand from across India. Here, we will refer to e-tailing, as a subset of e-commerce, which encapsulates all “commerce” conducted via the Internet. It refers to that part of e-commerce which entails the sale of product merchandise and does not include sale of services viz. railway tickets, airlines tickets, job portals, etc. In today’s competitive landscape, while a self-owned logistics system may be a key differentiator, it’s not clear whether it will be a long-term solution, or a one size solution that fits all. Developing a self-owned logistics network entails a huge investment, besides requiring automation, innovation, investment in IT and also sufficiently trained staff, which should be able to provide value-added services to the network. Express service providers offer the widest coverage to e-tailers. They also offer a wider spectrum of services such as API integration, POD, customer verification, data validation, fastest remittance of COD, low RTO’s, near ‘zero’ damages etc. These include niche express service providers who cater solely to e-tailing shipments only. Such players do not offer a wide spectrum of services and on the downside they have very limited geographical reach as compared to independent express service providers. They are also very poor in their cash remittances, transit times and are equipped with archaic, non-sophisticated systems. A handful of e-tailing players choose to have their own logistics support that is managed in-house. Captive players are mainly used as cost control initiatives and are used more in metros and easy to reach locations. There were also news around companies like Amazon looking to buy stake in logistics companies like Blue Dart and a few others. What are your views on this sudden spark in interest in logistics companies? On 14th January 2015, some media carried news reports about a possibility of Amazon buying the stake of DHL Singapore Pte Ltd. in Blue Dart. We maintain that these rumours are baseless and market speculations. I would like to clarify that DHL is not engaged in negotiations to sell its stake in Blue Dart to Amazon or any other party, nor have they engaged in such negotiations in the past. At the same time, I would like to emphasize that our commitment to providing customers with high quality service remains unchanged. What kind of changes do you feel are required from the government to ensure a healthy growth rate for this sector in India? India’s logistics sector is perched on growth, mainly led by a promising economic environment, ramp up in airport, sea ports, roads, highway and transport infrastructure, e-tailing penetration, impending GST implementation and other initiatives like ‘Make in India’. Infrastructural bottlenecks too that have stifled the sector’s growth and promoted inefficiency are being addressed by the government. The proposed Goods and Service Tax (GST) bill is expected to bring in more efficiencies. GST is expected to be implemented by fiscal year 2016-17 reducing multiple taxes. Inter-state sales transactions will become tax neutral making entire country one single common market. The proposed GST regime will alter the entire landscape. The GST implementation will be a game-changing event for businesses and particularly for organized logistics players while the logistics requirement for e-tailing will grow as exponentially as e-tailing itself. Logistics companies will therefore see a major change in the transportation of goods and location of warehouses, improved distances cover per day and consolidation of warehouses. We hope the Government keeps up with the pace of reforms. First and foremost would be our long pending demand of granting industry status, which would help the sector be independent and resourceful. The Ministry of Civil Aviation (MoCA) has put out a new draft ‘National Civil Aviation Policy’, 2015 which aims to create an eco system, to enable 30 crore domestic ticketing by 2022 which stands at around 7 crore in the year 2014-15. The policy in its mission statement mentions safe, secure, affordable and sustainable air travel with access to various parts of India and the world. We expect the government to not only speed up the task of developing airports but also ensure that access to business, manufacturing etc. is also developed. Also for quick processing of export and import cargo by the express players effective 24×7 functioning of customs is a prerequisite. How has E-Commerce impacted the way logistics companies work? What kind of impact do services like Cash on Delivery and Easy returns have on business? The Indian e-tailing sector which is estimated at € 5.2 bn in 2014 is expected to grow to € 39.4 bn (EU @82) by 2020 (Source: Euromonitor study). As the sector witnessed consolidation and big ticket investments, the year would be best remembered for m-commerce coming of age. Most e-tailers registered 40 to 50% purchasing traffic from mobile phones. Another interesting aspect which came to the fore is that over 50% of the business came from tier II and III towns & cities, which puts the onus on logistics service providers such as us to reach the interiors. The strong emergence of the sector has already put enormous pressure on the supporting logistics infrastructure. While pricing is one factor, the realm of competition has moved to delivering to ever-shortening delivery timeliness. Similar to any sunrise industry, e-tailing has posed a few challenges as well. Due to increase in internet penetration in Tier II & III towns, there is an increase in aspiration which stands at par with the metros and tier 1 cities. The need to handle such deliveries within the same time frame as any other metro has augmented the issue. Also, given that most online purchases are high impulse buying decisions, therefore the rate of refusals also is rather high leading to a high number of shipments returning to origin. Other issues that arise are cash handling and remittance to the e-tailer, fraud, counterfeit, mutilation and theft of cash etc. •	Insufficient aircraft bays, truck docking stations, limited space for express terminals, lead to delays and impact operational cost. In a price sensitive market like India, do you feel it is limiting for players like you to come up with better and more customised services? At Blue Dart we believe in ROI – “Return on Innovation”. We don’t attach a price to the offerings for our customers. It all depends on how much value it adds and convenience it offers them. Therefore, though the market is price sensitive, it has never deterred us from offering the best to our customers. How do you differentiate yourself and create a distinct identity in a market cluttered by so many unorganized players at the local and national level? Innovation is deeply ingrained in Blue Dart’s DNA since its inception. Over the years, Blue Dart, a leader in the express air and integrated transportation, distribution and logistics space has been at the helm of many innovations that have benefitted our end customers and hence will continue to be our focus going forward too. Blue Dart has invested heavily in technology infrastructure to create differentiated delivery capabilities, quality services and customized solutions for clients. This has enabled us to offer web-based solutions mentioned above to customers that can be integrated with their core products. Apart from providing customized technological solutions, Blue Dart’s reach in Tier II & III towns, timely remittance and periodic cash reconciliation are also some of the factors that offer us an edge over other logistics solutions providers. All the major e-tailing organizations work with us and with them, we have co-created solutions to offer value to our end customers. Blue Dart is the only domestic express company to have a mixed fleet of 5 Boeing 757 freighters and a flotilla of 8,348 vehicles which meet delivery schedules and speed shipments to their destinations. Blue Dart has always been a customer centric brand. We regularly conduct customer focus groups which have led to identifying new opportunities in the market place through constant research on customers, industry verticals and macro economic trends make it an intelligent organisation, resulting in new product initiatives & solutions that are customer-oriented. Blue Dart has a strong First Choice Culture and drives a quality program named First Choice that has a five step DMAIC (Define, Measure, Analyze, Improve and Control) methodology to long-term solutions. The brand also deploys the Net Promoter Approach that helps identify the Net Promoter Score and highlight areas of improvement. Customer Service is a nodal point between the customer and the organisation. To strengthen this relationship, we introduced Key Accounts Management. The mission of Key Accounts Management is “Retain and grow business and customer loyalty, providing uniform customer experience and innovative solutions delivered by our competent people” and Customer Loyalty program: Blue Points – Amazing Returns to engage the customer, build their loyalty; improve our Share of Wallet and retention. These initiatives have ensured high scores for Blue Dart in the latest Customer Satisfaction Survey (CSS) & Brand Equity studies. We have recently observed a sudden spike in instances of cheating by customers who claim that they did not receive their goods and tend to blame it on the logistics partner. How do you deal with such cases? Blue Dart has a structured grievance cell with defined and stringent escalation process and monitors. CARESS (Complaint, Appreciation, Resolutions, Evaluation, Satisfaction System) is used to record all complaints and appreciations. Each and every complaint is analysed and closed amicably to the customers’ satisfaction by ensuring that gaps are addressed and there is no reoccurrence. What additional avenues of growth are you looking to target? Blue Dart has been servicing the e-tailing industry ever since its emergence in India in 2010-11. Over the years, it has serviced all leading e-tailing players through its best-in-class, highly differentiated, last-mile delivery offering and value-added services. In 2014, Blue Dart successfully became a part of Deutsche Post DHL (DPDHL) Group’s Post – eCommerce – Parcel (PeP) division which has further enabled us to tap on the strong growth momentum seen in the dynamic e-tailing market in India. Through Blue Dart, DPDHL Group is investing in the right infrastructure – including IT and development of fulfilment centres, multiple delivery and payment options as part of its aim to become the preferred global provider of e-commerce related services which will enable end-to-end systems to deliver for e-commerce businesses. • Offers services such as Customer collect, Parcel Locke, IT integration of API, WDL and handheld scanners (OTM) for a real time performance, Auto Sorters etc. Besides this, Blue Dart is optimistic about the growth of select sectors like life sciences and healthcare, consumer durables, banking & financial services, computer/IT etc. which are largely domestic consumption-driven. The company will continue its focus on product innovation and service enhancements and registering good growth numbers by partnering in their growth. The SME sector is also a good avenue for growth and Blue Dart has been extensively partnering the sector in their growth through customized products and solutions and increased connectivity to markets. Besides, Blue Dart will also continue to focus on strengthening its reach into Tier II & III towns. What people related challenges do you face and how do you manage them? What are your thoughts on Cross hiring from sectors? Blue Dart follows the ‘People First Philosophy’, where it ensures to nurture and care for its employees and support their learning and development for further growth. As a company, it also emphasizes on succession planning, it always encourages the internal talent to grow and successfully take on higher roles creating a sense of fulfillment of their career aspiration. The company knows the value of second-line development and succession planning. All key positions in the company have a second line to ensure smooth succession and business continuity. Keeping with this philosophy and approach, leadership at all levels communicates, engages and guides the employees in achieving their goals and ambitions. Besides, motivating the employees, the leaders recognize the good work by their team members through various awards such as Bravo Award, Super Darter and Employee of the Year Award for showing excellent work. We welcome people from various industries to join us as long as they have the passion and dedication which every Blue Darter displays. Blue Dart is consistently voted as amongst the Best Places to work in India. What kind of culture exists within Blue Dart and how do you build a sustainable culture like this? Blue Dart Express Limited is South Asia’s number one express air and integrated transportation, distribution and Logistics Company, offers a comprehensive range of products and services for both domestic and international shippers. Blue Dart is the leader in the air and ground express industry in India and has a strong Brand Equity & Saliency. When it comes to managing talent, Blue Dart has always taken the front seat. Almost 97% of the senior management team are home grown talent and have grown from the ranks – a very rare phenomenon today in most organizations. In view of the strong brand equity, market leadership position and best people practices, this the company attracts all prospective employees including the youngsters for employment. It has always remained an Employer of Choice to attract the best of the talent from the market. The people policies, work environment, learning opportunity, rewards and recognition and career growth opportunities supplements the employer brand equity in attracting and retaining the young talents. The company has an attrition rate of 13-14%, much lower than the average industry attrition rate of about 24%. In fact, Blue Dart is one of the fewest companies that still has its Day One employees. I am proud of all employees and the contribution they make and the passion and commitment for the brand that they display every single day, be it a Day One employee or the one who joined yesterday. A noteworthy effort is the fact that in spite of huge pressures during the recent slowdown, Blue Dart did not take the easier route of retrenching people, instead focused on high performance and involvement of the management and the front-line. Today, this approach is paying rich dividends for customers, employees and every impacted stakeholder. Blue Dart follows a unique 360 degrees Top Down / Bottom Up approach for effective communications. On a monthly basis, a team brief takes place with key messages handed over in print. The team brief is then held with every subsequent level of reportees and within a span of 3-4 days, the entire organization is covered through the team brief. Each location has the scope to add in local information to make the communication even more relevant and challenging. Similarly, in each team brief, every employee has the opportunity to share their views/thoughts ranging on personal satisfaction, customer innovations or simply any idea. Apart from this initiative, townhalls / open-house sessions with employees are held on a regular basis to understand their issues/concerns and also to know from them how customers view the brand and the services. The company conducts open communications environment in which through formal and informal mediums employees as well as the management can communicate both ways. An Employee Satisfaction Survey (ESS) is conducted every year – and not surprisingly parameters such as ‘Pride for Working for Blue Dart’, ‘My future (employee) lies in Blue Dart’, ‘Blue Dart does a good work for its customers’ score high percentiles in >98% range. For more serious employee grievance, company addresses issues through a formal Grievance Redressal Program (GRP) this ensures that every employee gets a fair chance to handle any issues. Strong HR policies are a strong pillar; initiatives like STEP (Subsidized Tuition and Education Plan), BRACE (Blue Dart’s Reimbursement of Accident Claims and Expenses), Death Benevolent Fund and Medical Insurance for staff & family are innovations for employee delight. Another forward step has been the induction of HRMS People Soft package – PRIDE. This has improved the way HR dynamics work in the company. No wonder, the Day 1 employees still are an integral part of the organization and most managers are home-grown. Currently, the company has undertaken talent development initiative to develop and facilitate the talent movement within different business units. It has come up with a talent development framework focusing on structured and proactive career development approach in line with career aspirations of high potential middle managers. The framework will enable movement of managers within group business units in India based on the role availability. The initiative is aimed at opening up new opportunities for employees and helping them explore suitable roles within different business units. At Blue Dart, our focus has been on creating an enabling environment that provides for the all-round development of the individual talent. What is your Leadership Style? What are some of the few things you look for in an individual when recruiting for senior management positions? I believe in leading from the front and I’m a passionate believer in the fact that human beings create differentiated experiences. I have always championed the ‘People-First’ philosophy in the organization by encouraging creativity, innovation, entrepreneurship and empowerment. The annual Employee Satisfaction Survey score for ‘Pride in Working for Blue Dart’ which has constantly improved year on year is surely not a coincidence. As mentioned earlier, almost 97% of the senior management team are home grown talent and have grown from the ranks. Our people are our biggest pillar of strength. For me success is a journey and one has to keep travelling, excelling in whatever one has set out for. My mantra for success is to have the ‘Can Do’ attitude in whatever one takes up in life which has helped me a lot in achieving things which otherwise would be seen as difficult or insurmountable. The recipe for success is to always dream big and work hard to achieve those dreams, have passion, commitment, integrity and transparency in whatever one does. Professionally it is to remain dedicated of ‘being the best and setting the pace’ and delivering growth for Indian businesses. Blue Dart has always been a customer centric brand. Our customers will always be our priority; we fulfil their expectations with simplified services, industry-focused technologies and solutions, loyalty programs and by always listening and acknowledging them. We have always been prompt in identifying new opportunities in the market place through constant research on customers, industry verticals and macro economic trends, makes it an intelligent organisation, resulting in new product initiatives & solutions that are customer-oriented. We share this vision with people that are as committed and passionate about the brand; we specifically look for these when hiring people. Finally on an informal note, how does your average day look like and how do you like to spend your weekends? I’m an early riser and begin my day by 6:00 am. I am in office by 9:00 am and spend the day meeting people from various teams. Every day is a new challenge for us, understanding the industry and working solutions to remain relevant every single day. Weekends are usually spent unwinding with the family. I have always been a sports person and an athlete who ensures I include cardio and yoga in my schedule daily. I am an avid footballer and have represented my school in top honours, besides having an immense love for the game of cricket. My spouse Jyoti and grandchildren make all days enjoyable and cheerful. 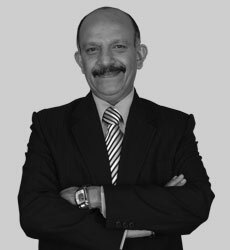 Mr. Anil Khanna is Managing Director of Blue Dart, South Asia’s premier courier, and integrated express package distribution and Logistics Company, and part of the Deutsche Post DHL group. He has been a Blue Darter for around 24 years, with an overall experience of 37 years across diverse industries. He took charge as Managing Director in 2007 and since then has led the organization successfully with clear strategic vision; focus on customers with incisive execution of customer centric value propositions, thereby consolidating Blue Dart’s leadership position in the market-place. The company became debt free within a year of his charge. 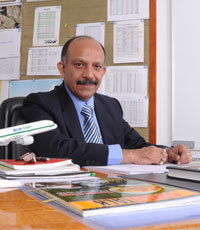 Under Anil’s leadership, Blue Dart has broadened its strategic focus from being an air express company since inception to being a company that straddles customer offerings across time definite, priority, deferred as well as focus on industry specific solutions in air and ground express segments. The company has increased its market share in Air & Ground Express. 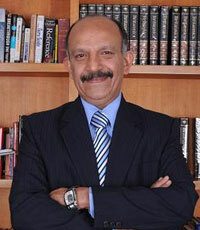 Anil is a member of Confederation of Indian Industries (CII), International Market Assessment India Pvt. Ltd, and the Express Industry Council of India (EICI), and is on the core advisory council of the Express Logistics & Supply Chain Conclave (ELSCC), he is also a sought after speaker and acknowledged industry thought and knowledge leader. Prior to taking on the hot seat as Managing Director, he was instrumental in transforming the Western Region by strengthening its sales systems & structure as the Senior Vice-President. In a short span of time, he turned it around to a highly resulted oriented region in the country. The Western Region of Blue Dart under his leadership became the No 1 region in the country. Before assuming charge for the Western Region, he also served as Vice President – Northern Region, again proving to be an astute sales professional & turn-around artist. Anil is a graduate from St. Stephen’s College, Delhi and holds an MBA degree in Marketing and Finance from UBS, Chandigarh. Anil lives in Mumbai and is married to Jyoti, a homemaker and his two children are successful young adults.